Lookie what happened over the weekend! There was a bird or a squirrel awfully close to the door and they were so intent on it that they SHARED THE DOOR! I know it looks a little uneasy, but they actually sat together like that for some time. 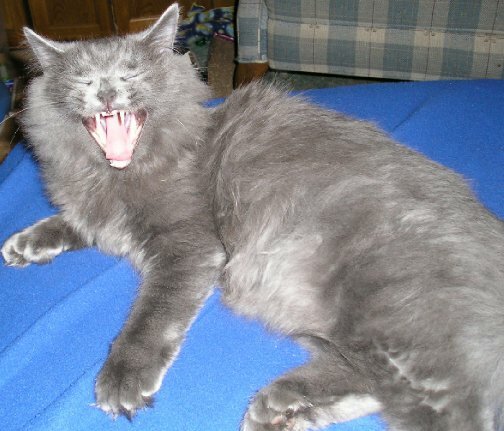 I got the camera out late though, and only got the one shot..
Oh, no whapping, no hissing, no fussing! That's the miracle! On Friday I posted pictures of a great bag that came into the house that the kitties claimed. They love that thing! Star mostly, but Leo too. Here's Leo having a turn. This bag is not only just my size, but it has some interesting smells. Hang on, gotta make sure Princess Hissyface isn't coming back to claim it.. Seriously, we're keeping this thing forever, right? There was a comment on that post from Caren and Cody of Cat Chat to be sure to cut the handles off for safety. Now, I'm one of those people who panics about some stuff and is blahzay about other stuff. For instance, I never liked my sisters kids being farther from me than I could physically reach out and grab them when we were at, say, the zoo, even when they were 9-10 (12-14..) years old but I didn't chase after them with hand sanitizer no matter what they got into. After all, when I was little we made mud pies, drank hose water, cut ourselves on rusty metal toys and lived to tell about it. So I thought about the straps on the bag, and even went so far as to tell Greg about the comment. He asked if he should cut the handles off. I said no, I doubt they'd have a problem. Besides, I'm not keeping that bag forever anyway. So wanna guess what happened? Go ahead. I'll give you a minute to think. If you guessed that someone got their head stuck in a handle, you'd be right. If you guessed that it was goofy boy Leo, you'd be wrong. That's right, prissy, lady-like, precious Star came out of the bag in just the wrong spot and her head went through the handle. Of course the rest of her did not follow. I want to preface the rest of this by saying that I've had a bad week physically. I'm way past due for shots in my knee and I twisted or snapped or did something to the other one in such a way that I could hardly walk for days. Greg had to take two days off of work to take care of me in fact. I say this so you know why I didn't immediately jump to Star's aid during 'the incident'. Ok, so Star came out and her head was through the handle. I saw her slowly realize that something was wrong. She tried to get her foot up through the hole too, as if she could come out that way. Did not work. Once her front feet hit the carpet outside the bag, it sort of flipped out behind/over her, almost like a paper turtle shell and the real panic struck. I cooed to her softly, striving for calm, telling her slow down, you're ok, hang on, as I tried to move. Forget it, girlfriend was not waiting for anything or anyone! Before I could blink, she had pitched herself into the chair behind her and was scrabbling to get up the back of it as well. That didn't work so she started over the arm and onto the side table next to the chair. On this side table is a slender vase with a couple of spent roses in probably stinky old water and a shriveled, desiccated, miniature rose bush in a little pot. I was SURE that Star and her bag were going to take out both of those and my favorite lamp as well. I braced for disaster..
Luckily, disaster did not come! Whew! Somehow she froze for barely a moment, then turned to try going up the back again. And when she did, she moved in just the right way that her head popped out of the handle and she escaped, leaving her clingy paper companion behind! Once she reached the safety of the back of the chair, she looked down on the now inert bag with hate in her eyes. I had the feeling she'd have chewed that sucker to bits if she wasn't taking refuge on the chair back! In all, this was over in a matter of less than a minute. Greg had been upstairs and I'd been giving him a play by play, hoping he might be fast enough to get her before I could get to my unsteady feet, and save her, and/or my lamp. He was down soon after everything settled and the first thing he did? He cut the handles off that bag! We weren't sure if Star would go back in it again after a fright like that. But my girl is courageous! No bag is going to get the better of me! I guess we know WHO cares about my well being and loves me the most, hmm? Thank you daddy, for fixing this thing for me! Caren, Cody, next time we'll listen to you! Oh my gosh! I had such a bad week that I totally forgot that our interview at Mousebreath was happening Friday! Please, check it out anyway. A day late is better than never?? 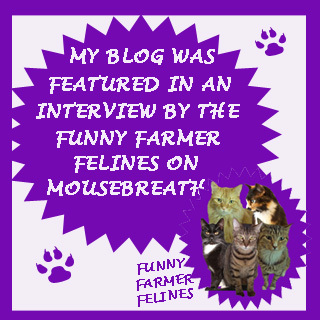 We love the Mousebreath interviews and hope you do too! Hope ours lives up to the previous ones! 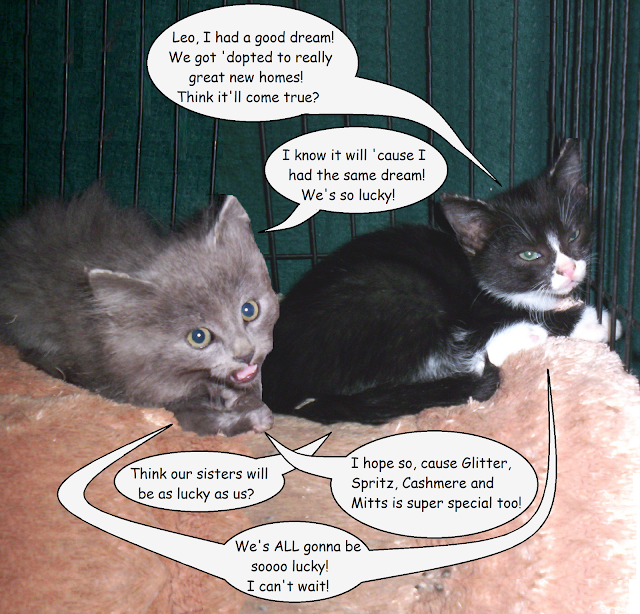 Edit: I just reread our interview and realized that when we did it, Leo's last sister still hadn't had a home. But now she does! 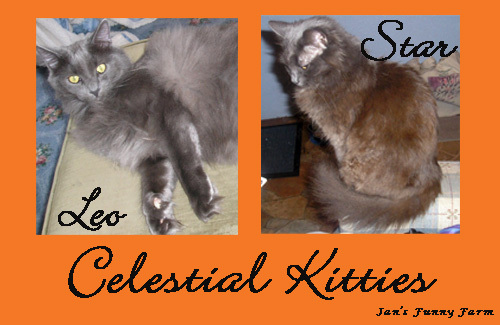 All of Leo's sisters are in great forever homes! 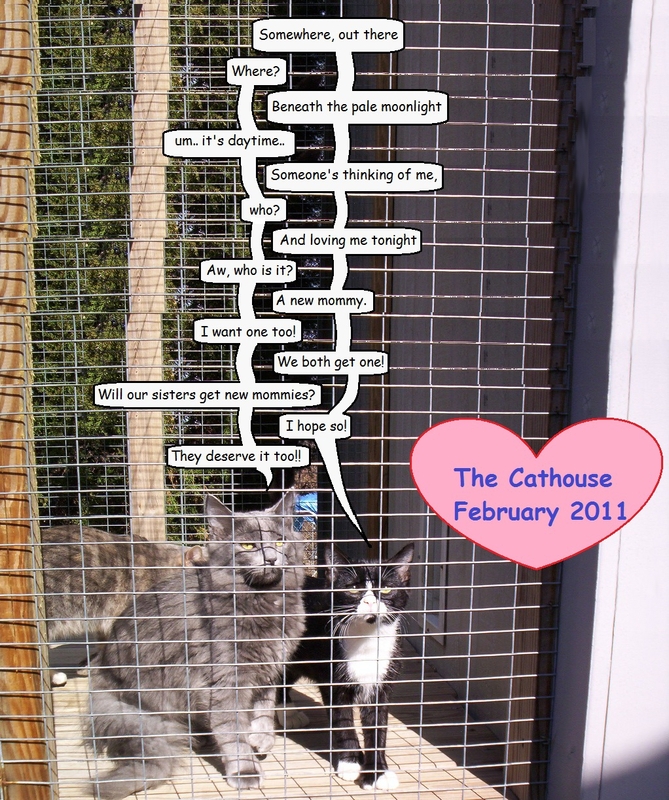 Of course, there are still lots of other kitties in the cathouse waiting for their people! Are they you?? A big bag came into our house. Of course this became a source of curiosity..
Star was the first to get in the bag. Leo saw and went over to investigate the rustling. Leo: Hmm, something is going on in that awesome bag. Leo: This bag has a tail! Hey.. is that my tail in the bag? Maybe I should grab it and check. Star: I wouldn't recommend that if I were you..
Leo: Eek! The bag speaks! Star left in a hurry. Before Leo got close to the tail! Then he had to inspect it for himself. Leo: Oo it is cool in here! Notice, please, the nose peek. Leo: Hmm, seems smaller from the inside. Uh oh! Who let the cat out of the bag?! Ha ha, mommy. *I* let myself out of the bag! Before I get to today's pictures I want to respond to a comment from yesterday. Maxwell at Tonk's Tail said this: And Leo dood, we won't even mention that it's a bit, err, lacy and stuff. No, you're too much of a mancat for that to hurt your image! I had to laugh at that because I thought the same thing especially when Leo had it all draped over him! But no, Leo doesn't let it hurt his mancathood! He figures anything he can kill is fine with him. Perhaps since it was kinda girly he was thinking it was maybe Star's toy.. That might have given him an extra urge to kill it! Ya never know! He would like you to know that no matter how much he likes new toys, nothing holds a candle to his stringie! So how did these wonderful new toys arrive? In a box of course! Who likes boxes? KITTIES!! Well, Star anyway. Leo hasn't given it much more than a rub on the outside. But Star has given it a thorough inspection. Why is mom going nuts over all that stuff but putting this great toy aside? That's right, I said it. This is my toy! Silly humans.. You think they'd recognize the good stuff by now. We got a package in the mail the other day! A cool package!! We won some great Laurel Burch stuff from Petsmart from Cat Chat's give away! So cool! We got a soft side cat carrier, a butterfly wand toy and a door hanger toy! At first it looked like Star and Leo were going to play with the toys together! Leo: If I don't look at Star, maybe we can play at the same time. Star: Maybe I can use batting at the toy as an excuse for 'accidentally' batting him..
Star: Oo! Good time to bap! Star: Let me think about smacking this.. I do prefer to play alone you know. Leo: Seriously? Maybe we should take turns then..
Star decided to head off upstairs for a while, so Leo REALLY got into playing! Ok, this is how I like to play! Tryin' to get away huh? I'm all wrapped up in my play now! uh.. I might be done here now. So all in all, the toys were a hit! I think we like this Laurel Burch! I tried getting some video of Leo being so animated in the window, but of course once I start the camera (or in this case the phone) he chills out. The goober. And of course the sun behind the window didn't help getting a very good picture. These are just because I thought they were funny! And I have no idea how to connect or link from tumblr where they're from so I hope no one is offended that I just loaded them here. I don't think this one was from tumblr, I don't remember where it is from though.. 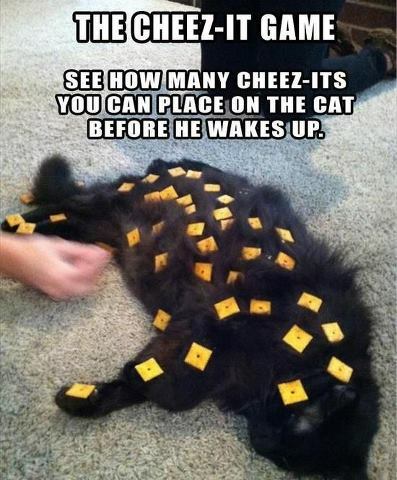 There's at least one kitty out there that I know would wake up on the first cheez-it! Right Caroline? Oh geez, just so Spitty doesn't get mad at me, I better post a picture of Star too! Purrrrs Spitty dear, come over and see me sometime. Hey mommy, it looks nice out. Can we have the window open? Thanks mommy, this is awesome! Hey Princess Hissyface, you should see this! Um... from down there though..
Wow, it's night time and the window is still open! We hope you all have a great weekend of window whiffies and bird and squirrel TV!! Wanna see a curly tummy? She's got her paw over her ear. Do you think she's tired of me talking about how cute her tummy is? We are all so VERY happy over here today! Did ya hear the news?????? ALL six siblings have homes of their own now! And best of all, Spritz went to live with their sister Mitts!!! How cool is that! You can read the whole story on Chrystal's Monday post here. As you can see, we're so happy we can't stop celebrating around here! MY SISSIES ALL GOT FOREVER HOMES!!!! YAY!!!!!! We hope you all have as great of a day as we are! We're dancing, hope you are too! Of course, that doesn't mean we're done supporting Chrystal and Winnie's Wish. :) There are plenty more kitties there waiting for their forever homes! New ones that just arrived last week too! So while you're over there reading the story, check out the adoptable kitties in the sidebar and see if you know where their forever home is! It's only one day, but today was finally a nice day! Tomorrow it's supposed to be cold and rainy again.. boo! But today the kitties had a great time because I left the door open ALL day long. I might have been a touch chilly, but the kitties were happy. And! There was no fighting over the door, by the door, or at any time! I think they were just so happy to be looking out and getting all those whiffs that they kind of forgot to not like each other! Not that they sat IN the door at the same time. But they took turns very well. Star likes to sit back from the door even when Leo's not around, it's just her way. Leo likes to be in the door, but he has to keep an eye on where Star is, so he was in and out a lot. Round about evening I realized that I had been watching them be so good and I hadn't taken one. single. picture. Seriously! Bad mom! So I took a few late and the light is awful. This is one way they both look out at the same time. Star is usually on the edge of the carpet, but here she's on the Royal Footstool. I tried to get their attention, just enough to get them to turn around so I could get their faces. It worked. They turned around. But Star immediately photobombed.. Guess she was disgusted by the flash in the face.. She left and I got this one of Leo. What?? I'm busy watchin' stuff! That boy stayed in the door for HOURS while Star napped. Oo did you see that! What was it? Oo, there's something else! We hope you all have some good weather and window whiffies this week!